Firewood is a wonderful asset to have for the prepared survivalist. You’re not reliant on electricity or gas to heat your house, you can cook on a wood stove or over a fire, and there’s certainly something special about watching, hearing and smelling a nice wood fire. Taking good care of your firewood is an important step in ensuring that you have a reliable source of heat for the winter. What are you burning your wood in? Do you have a wood stove or fireplace? Has the chimney been cleaned and checked? Are the clearance spaces around your stove and chimney good? While there is something special about heating with wood, it does come with the obvious problem of you having a fire going INSIDE YOUR HOUSE. This is inherently dangerous, but a lot of that danger can be alleviated by making sure your chimney and stove are in good working order, installing and maintaining smoke detectors, and having a fire extinguisher. It is also important to start out with good wood, as not all wood is made equal. Ideally, all you would burn is nice dried hard wood, like cherry, maple, or oak. But the reality is that as long as you properly store and dry your wood, burning soft woods like pine and spruce can be fine, but they sometimes require a little more attention. Firewood is measured in cords and face cords. Some people use the two terms interchangeably, but they mean very different things. A face cord is a stack of wood, four feet tall, eight feet long, with the wood cut to sixteen inch length. A cord is made up of three face cords, so that it is four feet high, eight feet long, and four feet deep. If you’re planning on heating entirely with wood, then you need to make sure that you get a good, solid supply of hardwood. Hardwood is better than soft wood for a few reasons. First, it has less creosote and sap in, so the chimney won’t clog up as fast. Second, hard wood lasts a lot longer in the form of hot coals. And third, it is much denser, so you get more burn for your buck. It’s fine to store your wood outside, especially if you are using it as a primary source of heat. The amount of wood you need is determined by the size of your house and the efficiency of your stove, so you’ll probably not have enough room inside to hold all that wood. 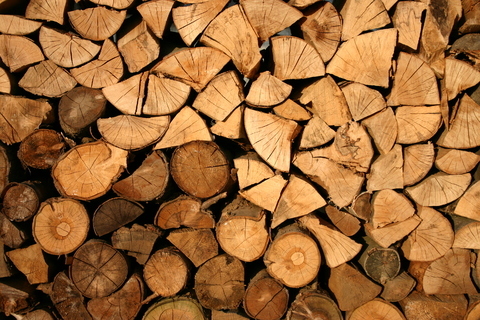 Storing your wood properly is the most important part of using fire wood for heat. Burning wet wood is not only hard to start a fire with, it can also clog your chimney and a big chunk of the energy created by burning goes straight up that chimney. Burning a piece of dry wood, you might be able to get into the ninetieth percentile in terms of efficiency. That means that ninety percent of the energy created by the burning actually turns into heat. Burning wet wood will only get you fifty to seventy percent efficiency, because a lot of the energy goes into evaporating the water in the wood, instead of being heat for you. Whether you store your wood inside or outside, there are a few similarities. The wood should be elevated off of the ground, and ideally there should be air flow all the way around the wood. There is a fine line to walk between stacking as much wood as possible in a certain space versus ensuring that the wood you store in that space is able to breathe and keep drying. If your wood is inside your house, you’re pretty much done once you get it stacked on pallets or boards. 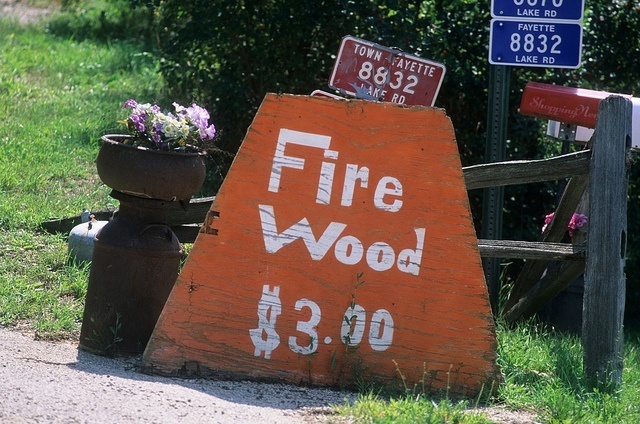 Make sure your wood is not too close to any combustion sources. But keep in mind that storing the wood in your house can also bring in insects, spiders, and pests, and can also provide a great place for rodents to live in. Building a designated wood shed is a great way to keep your wood dry, while not having to keep it all inside your house. 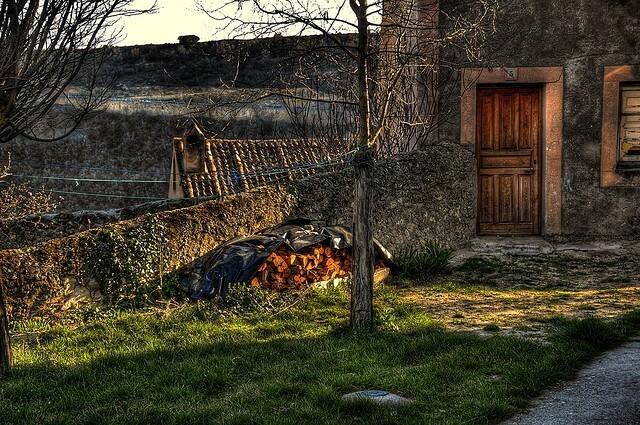 An old barn or animal enclosure can be used just as effectively. A shed is probably the best option due to the fact that the sides can be made to be mostly weatherproof while still allowing the maximum amount of air circulation. If you don’t have the space or a shed, then get yourself a lot of pallets and start stacking away. You can put boards or fence posts on the ends of the pallets to keep the rows of wood from falling outwards. Leave a few inches of space between the rows to allow for better air circulation. Without a real roof, the wood is more likely to get wet from the elements. That’s why it is imperative that you have a good cover over the wood once it’s stacked. It will be tempting to use old metal roofing if you can find it, and that’s fine, but you will need to be careful removing wood from the stacks. If you use solid roofing like that, you have to remove the wood in such a way that the roof doesn’t collapse. You can also use a large tarpaulin to cover the wood. Tie down the tarp on all sides but one, and then pull wood from that one side. If you plan on using a tarp, you can also make the stacks of wood a little higher in the center so that you have a peaked roof when the tarp goes on. Using wood to heat your home can be great way to be self-sufficient. If you have enough land, your heating needs are taken care of. However if you don’t properly store your wood, what should be a pleasure to use can become a nightmare, and in a SHTF scenario you’d wish you had followed these simple steps to proper year-round wood storage. What if you’re in the outdoors without a bowl? It seems unlikely, but it can happen. Learn here how to make a burn bowl out of wood. Never get stuck outdoors without power to charge your phone, camera or any other electrical device. Check out these lightweight and affordable portable solar panels. Planning your next hike in Cali? Check out the best place to hike in Big Sur.